“Wear those fleece tights,” he suggested, as I was getting dressed. “And here, put on my vest.” He packed up an air horn and my iPhone (“for emergencies”) in a quadruple-layer bagging system, loaded the kayak into the back of the CR-V, and drove me to the put-in spot. He zipped me into a life vest (the zipper was stubborn, big-man hands needed) and pushed me out into the water so I could keep my feet dry. “If you fall in,” he called after me, “call me, then paddle back as fast as you can. I’ll get to you.” It was verging on cold enough for hypothermia to be a problem if I went into the drink, he felt. Ten minutes later, I drifted under a bridge; I saw the red Honda first, then him, watching, as I floated under. “I figured if you made it past the first snag, you’d be fine,” he said later. It made me smile. It was splendid: perfect quiet, deep blue autumn sky, a stiff, chill wind riffling the water, sending light dances onto the bluffs. Great blue herons flapped by. An eagle soared across the water. Turtles plopped into still pools from their napping log. And a flotilla of ducks skittered aloft from a shady hiding place. 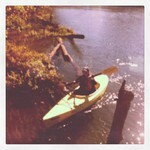 Icy drops of river water soaked into my tights, but Hal had showed my how to paddle so as to mostly keep dry. And everywhere, the burnt-red of Northern Red Oak leaves ignited the banks, giant, desiccated sycamore leaves rattled like paper lanterns in the wind, and floated by like tiny boats. When I beached it, Hal was already there, ready to haul out the bow so I could I step out onto dry ground. He loaded the kayak into the Honda, and we headed back. The question is: is it wrong for an “independent woman” to let herself be cared for so thoroughly by a big strong fellow like Hal? I sincerely hope not, because it feels pretty wonderful. Here’s my take: the point is to take care of each other in the ways you know how. Hal is large and can lift heavy objects; and he’s also an experienced outdoorsman (a former climbing instructor in New Mexico) with a freaky-genius mind for orienteering. So when it comes to heavy object moving, navigating in the mountains, or cooking meat on a campfire, he’s in charge. I get what feminists are talking about—there’s an ugly history in our culture of Mad-Men-style “care” of wives that doesn’t empower, it suffocates—stifling women’s ambitions and self-sufficiency, simply to service a certain type of male ego. That doesn’t seem like love to me. It seems like fear—fear of what women could do if set free. I’m here to tell you that plenty of men aren’t like that. Hal, for example. My successes don’t threaten him, they thrill him. He would like nothing better than for me to make scads of money as a novelist and keep him in the manner to which he deserves to be accustomed. With him in my corner, I’m not stifled. I’m stronger. And that’s why I have no problem whatsoever letting him take extra special care of me sometimes. As long as I get to do the same, when it’s my turn. Oh, and by the way? Did I mention that Hal and Jason made the most incredible ever lamb chops on the fire that night? I made potato salad & haricot vert-so not completely useless. It was quite possibly one of the best meals I’ve ever had. A Parisian bistro in the forest. I ask you, who doesn’t want this kind of spoiling? And does it make me a bad person to enjoy it? Bravo Kim on finding the strength to allow those who love you the permission to show it — accepting the gift of another’s caring is an act of grace. Or in other words . . . way cool! Envious of your float. I know that eagle. Miss the river and happy to find your article . . . almost as good as being there. Thanks, Denise! I hope all is well with you! What a great story and beautiful day…Sometimes it is nice to let others care for us, and sometimes they like it back! I love this. Absolutely adore it! A sweet unraveling of how to do love in, what I would call, a feminist way for sure! Heather! Thank you for this sweet note! !